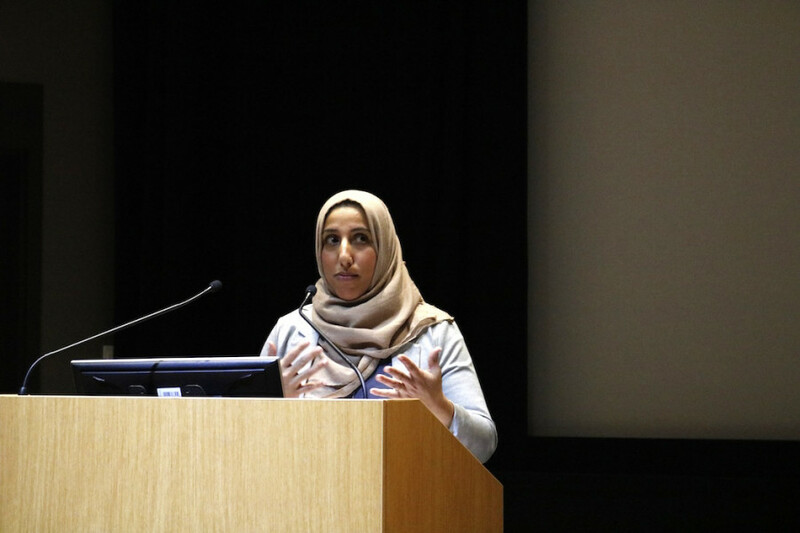 As Shireen Ahmed fondly discussed some of the challenges faced by Muslims going to the US, the outspoken writer and activist became vulnerable when speaking of a recent experiences she had with her daughter. “Two weeks after explaining to her what to do if she’s in a mosque and someone starts shooting, I’m in the car on the way to a soccer tournament and explaining to her what the course of action is if we’re at the border and we’re detained,” she said, fighting back tears. 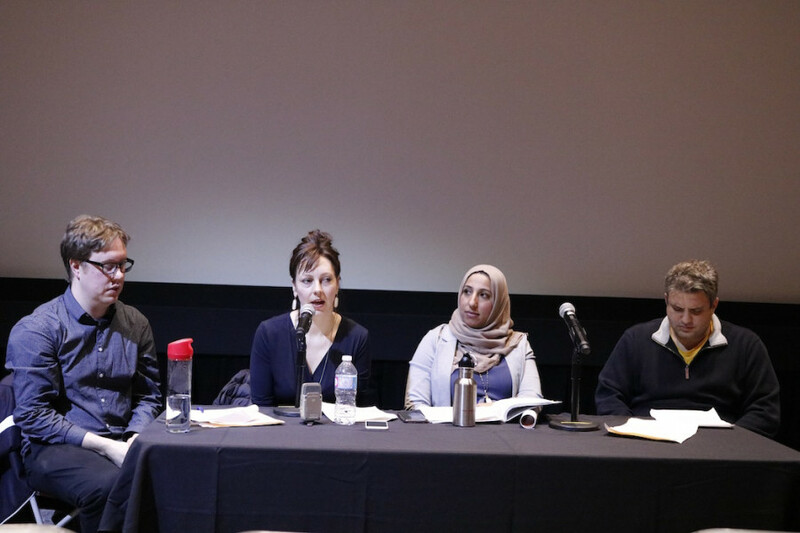 Ahmed, who writes for the “Tales from a Hijabi Footballer” blog, stood on the podium at the D.B Clark Theatre in Concordia’s Hall Building on Friday, Feb. 17. 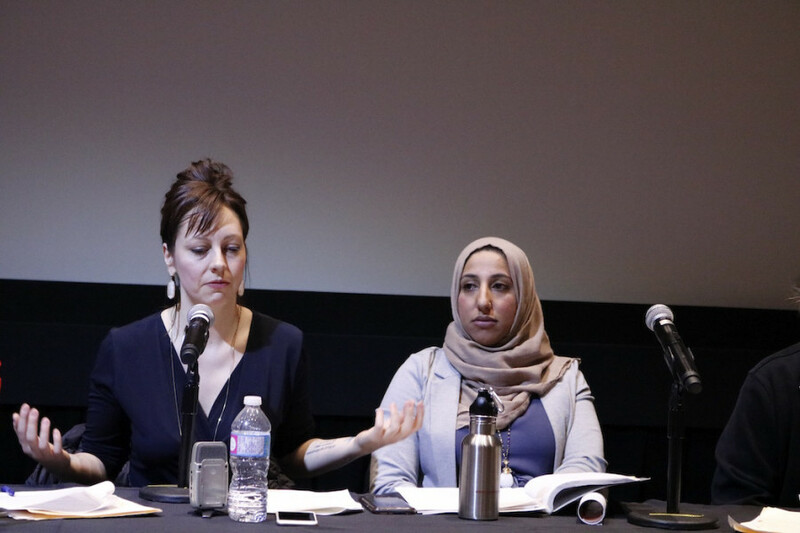 She was one of four panelists listed to speak at the “Taking a Knee, Taking a Stand: Resistance and Sport in the Age of Trump” panel discussion, organized by Aaron Lakoff, a Concordia masters student in media studies and host of The Rebel Beat podcast. 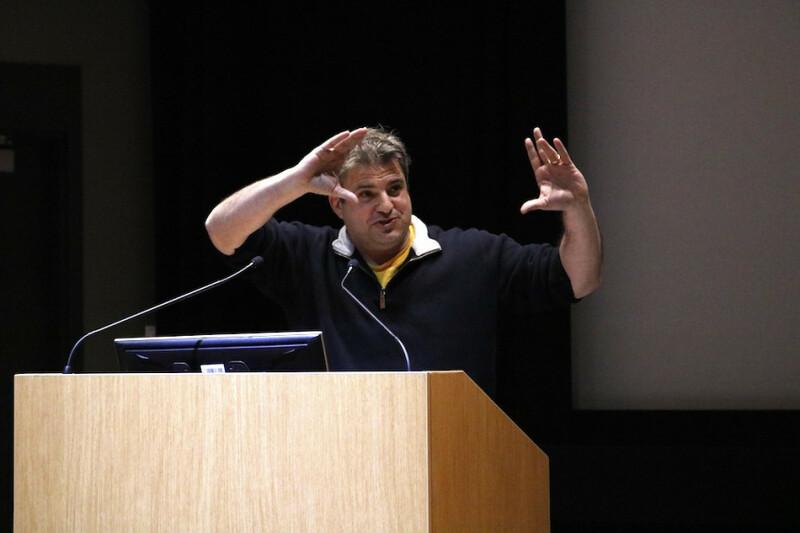 Not far from Ahmed, Dave Zirin—the sports editor of The Nation magazine and founder of the Edge of Sports podcast—was standing at the podium, patiently awaiting his turn to speak. Alongside him were Jennifer Drummond, the coordinator at Concordia’s Sexual Assault Resource Centre and Rana Salah, a Concordia student, poet and board member of the Center for Gender Advocacy and the Quebec Public Interest Research Group. The free event was meant to provide a space to talk about the current state of sports—and athletes’ relationship to social justice and resistance movements in the Trump era. Activism among athletes is nothing new. From Muhammad Ali vehemently contesting the Vietnam War, to Colin Kaepernick kneeling during the American national anthem during NFL games in protest of police brutality, the level of resistance movements in the world of sports is on the rise. While many see Trump as the the most visible manifestation of issues such as Islamophobia, most of the panelists argued that “President Agent Orange”—a term coined by rapper Busta Rhymes and quoted by Ahmed in her talk—is merely one part of a systemic problem. At the very first mention of Trump’s name—when Lakoff began introducing the event—the disgust on Zirin’s face was telling about his feelings of the American president. Salah, the first speaker of the night, spoke eloquently about the Quebec City mosque shooting, stating that people should refrain from thinking that this attack purely resulted from Trump’s ascension to the political throne. She also spoke about Islamophobia in Canada, and how this country has been a breeding ground for it—especially since the 9/11 terrorist attacks. “Please be reminded that the shooting that took place was not random, and nor is it an isolated case of violence,” she said. “As hijab-wearing Muslim myself, not one day goes by in which I can fully guarantee that I will not face any form of Islamophobic violence,” she said candidly. Salah was followed by Drummond—who likes to be called “JD”. She spoke about beginner level workshops that are specifically tailored to educate Concordia Stingers coaching staff and athletes. She works on demystifying the meaning behind consent and sexual violence. The workshops, which have been around for two years, are mandatory for the players and coaches, even if they received training the year before. While Drummond believes that it’s “a step in the right direction”, she believes that for change to occur within the teams, respective captains should lead these workshops. Ahmed and Zirin were the final two speakers of the night. The former spoke in length about a number of issues, most notably the effect of the travel ban on athletes of Muslim descent. She also believes that while many famous athletes have raised their voices against instances of injustice, many such figures have been male. She believes that the foundation of many resistance movement are those who are most marginalized by society—women. The freelance journalist, whose work has been featured in Sports Illustrated and the Globe and Mail, continued to raise issues faced by women of color, in particular Muslim women. To cap the panel discussion, Zirin took the podium and spoke candidly about Colin Kaepernick’s action. The author of several books, such as Brazil’s Dance with the Devil, believes that the quarterbacks statements separate him from other outspoken athletes like Lebron James, whose messages often call out for peace. The political sports journalist also defended the fact that the rise of sports activism is in no way a result of the Trump presidency, citing previously mentioned examples in Muhammad Ali and highlighted the media’s hypocrisy in speaking of both Ali and Kaepernick’s intentions.